Control are easy, tilt left or right for side thrusters. Tilt back for main thrusters. You must land squarely on a landing pad, green is the easiest, orange middle and red is the most difficult landing pad but will reward with the most points. 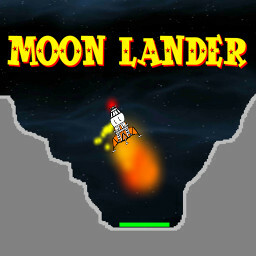 Beware, if you land on the moon surface and not a pad then the lunar lander will sink and explode! There are 3 levels of difficulty, on easy you have more fuel and the lander is a little more robust. On difficult, the lander is very fragile with not much fuel on board, however you'll get a stack of points if you land successfully. The screen will scroll left and right to reveal upto 6 landing pads, although on the more difficult levels you may find some are out of action and you'll need to travel further to find a safe landing place. 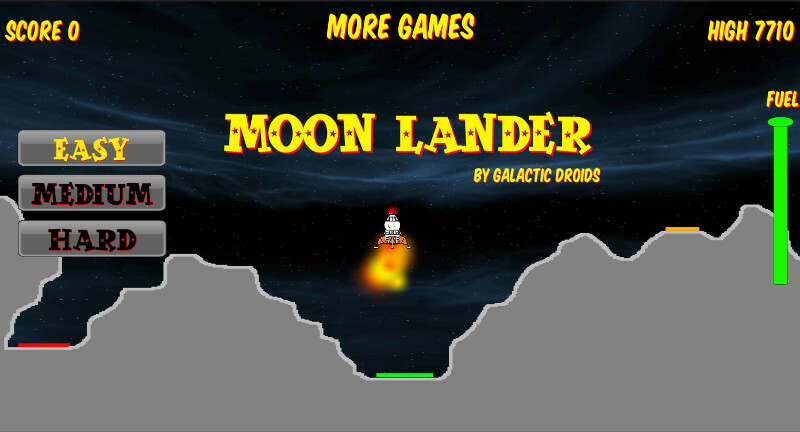 Download and play Moon Lander now.